Basic EKG II Interpretation is designed to provide healthcare professionals the ability to interpret basic EKGs (electrocardiograms) and recognize myocardial infarction (MI). Students will increase their confidence in interpretation and practice through this course. The program is devoted to learning the basics of the electrical conduction system of the heart, wave forms, a normal sinus rhythm, sinus dysrhythmias, atrial dysrhythmias, junctional dysrhythmias, heart blocks and ventricular dysrhythmias. A variety of teaching techniques will be used including: lecture, practice interpreting rhythm strips, videos, and case studies. 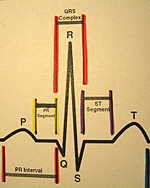 Upon successful completion of the course, you will be able to interpret EKG Lead II rhythm strips. This is a needed skill to care for monitored patients AND a great prerequisite for the ACLS class. Course Materials are provided in the course fee and distributed at the first class session. This class consists of two 9 hours days and one 4 hour evening class. Once you click on the registration link it will direct you to select a specific course offering that will contain the dates and times of all sessions. Certificate of Completion from Emergency Medical Training Services (EMTS) upon completion of written test. Healthcare providers wanting to take ACLS and those people with a medical background wanting to be a monitor tech or more involved in code management. Classroom Setting (all comfortably seated in chairs) with Instructor. Material will be provided during class.